The 2007 World Series of Poker suffered a serious setback before it even began. The Unlawful Internet Gambling Enforcement act was passed into law on September 30, 2006, and it would seriously cut into the number of players that was supplied by online card rooms. The surreal tournament size of 8,773 that had happened the year before in the main event would surely not be reached. The question on everyone’s mind at the start of the WSOP in 2007 was not whether or not the size of the main event would shrink year-over-year for the second time in history, but by just how much that number would shrink. The final verdict still represented a very strong field that was the second largest live poker tournament in history at the time, with 6,358 participants. Fifty-four bracelet events took place in addition to the main event and the entore length of the Series ran from June 1, 2007 until July 17, 2008 at the Rio Hotel and Casino in Las Vegas. The first event that summer saw a record fall for the third year in a row as Steve Billirakis won the first preliminary event, the $5,000 mixed hold’em event. He became the youngest player to win a bracelet ever, at 21 years, 11 days of age. Other professionals that made some noise in the preliminary events of 2007 included Bill Edler, Robert Mizrachi, Eli Elezra, and Jeffrey Lisandro who won their first bracelets, Allen Cunningham, who won his fifth bracelet, and Erik Seidel, who won his eighth gold bracelet in the $5,000 deuce-to-seven draw lowball event, the final preliminary event of the summer before the main event. 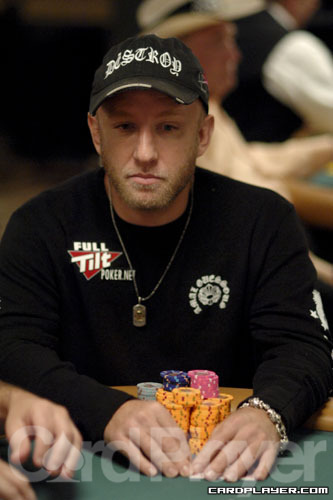 Tom Schneider took home player of the year honors in 2007, by winning two bracelets ($1,000 seven-card stud eight-or-better and $2,500 Omaha eight-or-better/seven-card stud eight-or-better). All of those feats were impressive, but they paled in comparison to another record that fell that year. 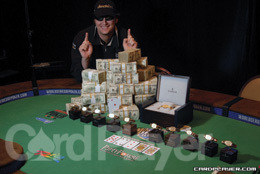 Phil Hellmuth won his 11th gold bracelet in a $1,500 no-limit hold’em tournament, and he became the all-time bracelet leader, edging out Doyle Brunson and Johnny Chan who each own 10. The main event field of 6,358 played down over the course of six days of poker. The final nine included an international group of representatives. Raymond Rahme (South Africa), Alex Kravchenko (Russia), Lee Childs (U.S), Jerry Yang, (born in Laos, current residence: Madera, CA), Lee Watkinson (U.S.), Tuan Lam, (born in Vietnam, current residence: Ontario, Canada), Phillip Hilm, (born in Denmark, current residence: Cambridge, U.K.), Jon Kalmar (U.K.), and Hevad "Rain" Khan (U.S.). 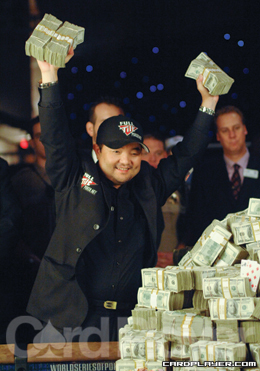 Yang came out of the gates as a different player when play began at the final table. He became an aggressive lion, and quickly built his stack by playing a complete opposite style than he had before. Yang won two huge pots that were worth over 10 million, and then he also sent the first player to the rail in ninth place, when he busted Hilm, who had missed a flush draw. After that elimination and the torrent of activity that preceded it, he was the chip leader with 44 million. Yang continued his strong early run when eliminated the biggest name left in the tournament a short time later. Yang opened a pot for a raise and then Watkinson moved all in for his final 8,175,000 on top of Yang’s raise preflop. Yang made the call, and they turned up their hands. Yang held A 9 to Watkinson’s A 7 , and after the board was dealt 6 4 2 K J , Watkinson was out in eighth place, and Yang increased his chip lead to 55 million. Yang then eliminated Childs in seventh place and after the pot he held over half of the chips in play. Yang kept up his pace and cotniued to hold sole responsibility for every elimination at the final table up to that point, when he knocked out Khan in sixth place with pocket jacks as his tool of destruction. Rahme got in on the act next, when he held pocket jacks, and his opponent, Kalmar held A-K. Kalmar was all in for his tournament life before the board ran out 10-9-6-3-3 and he was eliminated in fifth place. Kravchenko was able to double up a few times during the next, long stretch of play, but he finally met his doom at the hands of Yang during the 12th hour of the final table. Yang held pockets eights against Kravchenko’s A-K and the board fell Q-9-8-4-3 to bust Kravchenko in fourth place. Rahme fell next, when his pocket kings ran into a pair of aces that were held by Yang on a flop of A J 8 that Rahme had chose to move all in on. Yang held A-5 in the hole, and the 3 and 2 fell on the turn and river. Rahme was out in third place, Yang had eliminated all but one of his opponents, and he now held over 100 million heading into heads-up play. Lam held 23 million. Lam was knocked down even further by the aggressive play of Yang, and he needed to survive a double up just to bring his stack back above 18 million. He won a few key pots in a few key spots to approach 24 million, but Yang’s advantage proved too much to overcome. Sixteen hours into the final table Yang snapped off an all-in bet from Lam with a pocket pair he held earlier in the night, pocket eights. Lam flipped over A Q and the board was dealt Q 9 5 7 6 . Yang won the tournament, and he made good on his promise to donate 10 percent of his first-place pirze, worth $8.25 million, to various charities during his year as world champion.